The unification of Jerusalem following the Six Day War marked a new chapter in the city’s 4,000-year history, as Arabs and Jews adjusted after two wars to life without a border between them. Abraham Rabinovich covered the momentous period as local beat reporter for The Jerusalem Post. Jerusalem was transformed during these years from an urban backwater into a vibrant city worthy of its name. Amidst the religious and political passions unleashed by unification, eccentricity found fertile ground. In this overview, Jerusalem on Earth lingers on individuals who, in their distinctive, sometimes bizarre, personalities and world views, reflect the intensely human, and fascinating, diversity that was, and is, post-1967 Jerusalem. – An arsonist who sets fire to Jerusalem’s al-Aksa Mosque, third holiest site in Islam, comes close to touching off a new war. Thousands die in Moslem riots in India and elsewhere. Jihad is averted when the culprit is discovered not to be an Israeli, as suspected, but a psychotic Christian sheepshearer from Australia who wishes to be anointed king of Judea. – The Vatican, in an unprecedented move, sues one of its own religious orders in a Jerusalem court, each side represented by a Jewish lawyer who is expert in canon law. The Israeli government has the sale aborted in order to persuade the Holy See that Israel, with which it has no diplomatic relations, is not out to Judaize Jerusalem. Diplomatic relations are established not long after. – An ultra-religious Jew who crossed into Jordan as a young man to seek arms for a revolt against the secular Zionist state, engages his former prosecutor three decades later in a debate on the German philosopher Nietzsche before a packed Jerusalem hall. – A former translator for Jordanian intelligence in East Jerusalem — an Arab scholar enamored of the Hebrew language — publishes the first Arabic translation of the Mishna, the ancient compilation of Jewish law. Its descriptions of daily life in antiquity evoke in him nostalgia. – The murder of two nuns, a mother and daughter, in a Jerusalem convent temporarily suspends hostilities between the ‘White’ Russian church in East Jerusalem and the ‘Red’ Russian church in West Jerusalem. – In what psychologists would come to call the ‘Jerusalem Syndrome’, a number of tourists are briefly hospitalized each year after succumbing to the city’s aura and assuming the persona of biblical figures. – Danish-born Sister Abraham, who speaks 15 languages and navigates the city on a bicycle, becomes the first white woman to be accepted as a nun in the Ethiopian church. She writes a book and solves a mystery. – A police agent sent into the Mea Shearim quarter to penetrate a militant ultra-orthodox fringe makes surprising friends. – A maverick American architect, stopping off in Jerusalem with a backpack and sketch book, derails massive building projects and saves the city’s skyline before moving on. – Arab and Jewish underworlds are among the first sectors to join forces after the war. The police are not far behind, with joint Arab-Jewish patrols. – A rare look into the inner sanctums of the Hassidic world as street war breaks out between feuding factions. 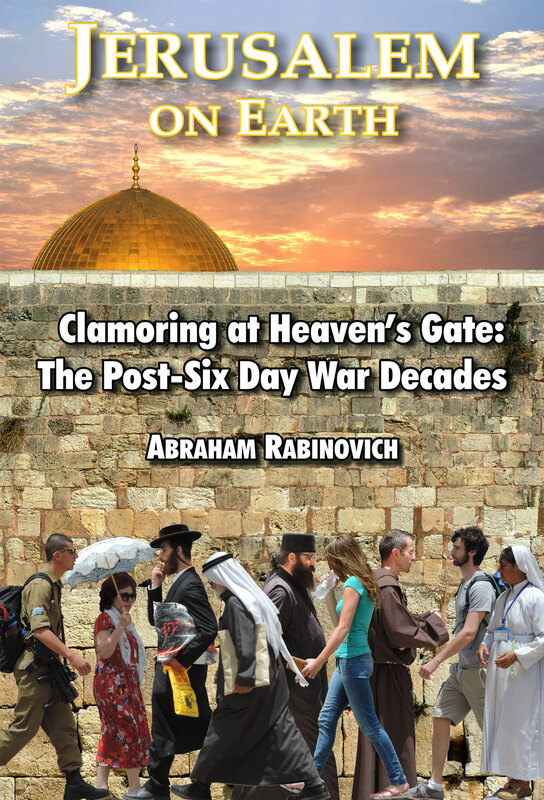 – A rabbi and an Arab village chief meet in the Mount of Olives cemetery to discuss which has priority – the rights of the dead or the rights of the living. Through it all, we watch Mayor Teddy Kollek – “the most famous mayor in the world” — preside over the city with skill, wit and a defiant conviction that unification of the two Jerusalems can work.